The McDaniel College Department of Music’s Monday Night Music Series will present a concert featuring Rob Sirois, Mindy Niles, Rachel Andrews and, David Duree on Monday, November 12 at 7:00 p.m. The concert will take place in McDaniel Lounge. Among the pieces on the program are, “Cinq Pieces en Trio,” by Jacques Ibert, Prelude and Divertissement by Eugene Bozza, Solo for Oboe by Emile Paladilhe, Rhapsody for Solo Bassoon by Wilson Osborne, Trio for Oboe, Clarinet and Bassoon by Georges Auric, and “Aquela modinha que o Villa nao escreveu,” by Francisco Mignone, which will be performed as a tribute to late, longtime McDaniel Music Department faculty member, Norma Hooks. 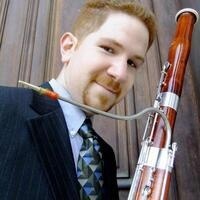 Rob Sirois, bassoon, received his Bachelor of Music degrees in Bassoon Performance and M Education from the Peabody Institute, where he studied bassoon with Phillip Kolker and instrumental conducting with Dr. Harlan Parker. Mr. Sirois continues to focus his career in the field of education, having recently completed a Masters in School Administration at the Johns Hopkins University School of Education (Columbia, MD). He is currently teaching general music and chorus throughout the Howard County Public School System. Mindy Niles, oboe, received a Bachelor of Science in Music Education from Lebanon Valley College and a Master of Music degree in Oboe Performance from the University of North Carolina at Greensboro. She has been a member of the Greensboro Symphony Orchestra and the Symphony Woodwind Quintet. Niles has taught instrumental music in the public schools and has served as an adjudicator for the Maryland All-State Bands and Solo & Ensemble Festivals. She performs frequently as a freelance oboist and is a member of the Mistral Woodwind Quintet. Niles is adjunct faculty at McDaniel College and Carroll Community College and maintains a private studio in Carroll County. Rachel Andrews, piano, graduated from Towson University with a B.S. in Piano Performance. Mrs. Andrews has been teaching piano for 25 years and is the instrumental accompanist at McDaniel College. She also accompanies for many students in the Solo and Ensemble Festival and for many competitions and recitals throughout Maryland. David Duree, clarinet and saxophone, studied at the Jordan Conservatory, the University of Maryland and the Catholic University of America with such renowned pedagogues as Harold Wright and Ignatius Gennusa. For ten years, he was principal chair saxophone of the U.S. Naval Academy Band and for twenty-two years, principal chair clarinetist (and founding member) of the Annapolis Symphony Orchestra. He has appeared as soloist with the Annapolis, Salisbury, Frederick, and Westminster Symphony Orchestras. Mr. Duree is an adjunct lecturer in music at Hood College, Carroll Community College and McDaniel College, where he teaches clarinet and saxophone and conducts the clarinet and saxophone ensembles. He has recorded for Centaur Records. Mr. Duree performs with the Two Rivers Chamber Orchestra, Hood Chamber Players, MISTRAL Woodwind Quintet, and the Dumale Trio. The concert is free and open to the public. For more information, call 410-857-2599.